Berlin-based indie natural brand April Aromatics has launched Pink Wood, a new oud fragrance. This is an Oud based perfume and consists of equal parts of root extracts and plants growing close to the earth, such as Sandalwood, Agarwood, Cistus, Labdanum, Oakwood and heart notes such as Rose Otto, Rose absolue, Geranium and sweet pink fruity notes. Our roots are where we are born into, yet we can feel home wherever we lay our “heart” on. Combining root and heart notes in this perfume, is a representation of feeling home within ourselves, anywhere in the world. The heart notes lift up the root “base” notes and soften them into a beautiful bouquet. Since I have traveled almost all my life, I had to find my “roots and realized early on, that they are not necessarily where we are born into. Esp. Not our families. 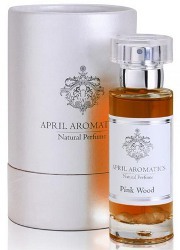 April Aromatics Pink Wood is €142 for 30 ml Eau de Parfum. Drats! I was very excited until I saw the word oud. Oh well, money saved. Despite initially flaring my nostrils at OUD, methinks the combination of OUD and the other assertive notes may make this perfume less oudy. Other than San Francisco Rose, the April Aromatcs line is off limits for a large sample purchase. It could well be. And off limits for me too!